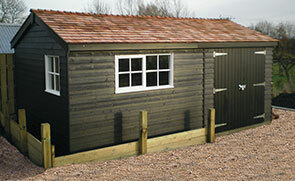 Our range of Classic Garden Sheds offer the ideal storage solution for keen gardeners and busy families alike. Designed and hand-crafted at our Norfolk factory, the sheds are made using FSC® certified Scandinavian Redwood timber and 4mm toughened safety glass. 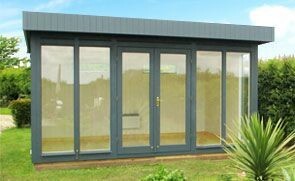 As part of the service offered by Crane Garden Buildings, all purchases are then both delivered and installed by our expert team of in-house fitters. This show-stopping Garden Room was recently installed for a customer based in Cheltenham, Gloucestershire after being designed and built by hand at our Norfolk factory using FSC® certified Scandinavian Redwood timber. Measuring 6.0 x 6.0m, the impressive building was then both delivered and assembled at the customer’s address by our in-house installations team. This attractive, high-quality timber Garden Shed was selected from our range of Superior Sheds by a customer based in Painswick, Gloucestershire. Designed and built to order at our Norfolk factory, the shed was then both delivered and installed by our expert installations team. Entirely fabricated using FSC® certified Scandinavian Redwood timber and expert craftsmanship, the shed is the ideal storage solution. This Victoria Greenhouse was recently selected by a customer based in Chipping Campden, Gloucestershire as an addition to their well-kept garden. Chosen from our vast range of FSC® certified Scandinavian Redwood timber garden buildings, it was designed and built by hand at our Norfolk factory before being both delivered and installed by our expert team of in-house fitters. A customer based in Lechlade, Gloucestershire recently ordered this stunning FSC® certified Scandinavian Redwood timber Summerhouse as an addition to their well-kept garden. 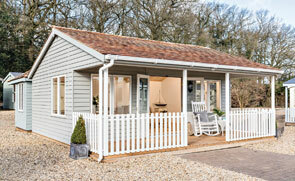 With a charming veranda and a beach-hut appeal, the Morston Summerhouse is the perfect option for those who can picture themselves enjoying the evening sun or morning birdsong on the veranda. Measuring 2.4 x 3.0m, the building was designed and hand-built in Norfolk, before being delivered and installed by our in-house fitting team. Selected from our range of FSC® certified Scandinavian Redwood timber Garden Buildings, this modern and stylish Garden Studio was recently installed for a customer based in Berkeley, Gloucestershire. Compact, convenient and contemporary, it makes for the ideal space to pursue hobbies, interests or even your dream career. One of our stunning FSC® certified Scandinavian Redwood timber buildings was recently installed for a customer based in Tetbury, Gloucestershire. Fully insulated and lined with natural pine lining, the building makes for the perfect work-from-home office combined with storage shed thanks to the partition. To make the process even easier, our in-house installation team delivered and assembled the building at the desired address. This charming Morston Summerhouse was recently selected from our range of FSC® certified Scandinavian Redwood timber Summerhouses by a customer based in Stow-on-the-Wold, Gloucestershire. Designed and hand-built in our Norfolk factory, the building was then both delivered and installed at the customers address by our team of in-house fitters. A customer recently ordered this attractive Superior Shed from our range of FSC® certified timber buildings. The shed was then designed and hand-built at our Norfolk factory before being both delivered and installed by our expert fitting team at the customer’s address in Mitcheldean, Gloucestershire. Selected from our range of stylish FSC® certified timber Garden Buildings, this Salthouse Studio was recently chosen by a customer and then both designed and hand-built at our Norfolk factory. The 3.0 x 4.8m building was then delivered and installed by our expert fitting team at the customer’s address in Painswick, Gloucestershire. This charming Wiveton Summerhouse was recently designed and built by hand at our Norfolk factory before being both delivered and installed at the customer’s address in Kemble, Gloucestershire. Selected from our stunning range of FSC® certified timber summerhouses, the Wiveton boasts a distinctive octagonal design and elegant aesthetic. This attractive Superior Shed was recently installed for a customer based in Bilbury, Gloucestershire as the ideal garden workshop. Designed and hand-built at our Norfolk factory, the shed was then both delivered and assembled by our in-house installation experts. One of our stylish and contemporary FSC® certified timber Garden Studios was recently installed by our team of in-house fitting experts for a customer based in Stow-on-the-Wold, Gloucestershire. Measuring 4.0 x 4.2m, the building was designed and hand-built to order at our Norfolk factory by skilled craftsmen. As part of our range of stunning FSC® certified timber buildings, we have a selection of Summerhouses that all offer a different outdoor escape from your every day life. This Blakeney was ordered by a customer based in Winchcombe, Gloucestershire to serve as a reading room in an attractive area of their garden. It was designed and hand-built in Norfolk before being both delivered and installed by our expert, in-house fitting team who ensured everything was perfect before leaving the premises. Designed and hand-built at our factory in Norfolk before being both delivered and installed at the customer’s address in Fairford, Gloucestershire, this Blakeney Summerhouse was selected by a customer from our range of stunning FSC® certified timber garden buildings as an attractive outdoor retreat. Our range of attractive and high-quality FSC® certified timber Garden Sheds are all designed and hand-built at our Norfolk factory before being both delivered and installed at the customer’s specified delivery address by our expert, in-house fitting team. This particular customer is based in Newent, Gloucestershire and needed a high-quality product with a custom door. This charming building from our range of National Trust garden sheds was recently delivered and installed by our expert, in-house fitting team at the customer’s address in Stow-on-the-Wold, Gloucestershire. This contemporary and attractive Salthouse Studio was recently delivered and installed by our expert, in-house fitters for a customer based in Cirencester, Gloucestershire. Designed and handcrafted at our Norfolk factory, the studio was fabricated using only the finest FSC® certified timber. This handsome Holkham Summerhouse was recently installed for a customer based in Tewkesbury, Gloucestershire. Designed and hand-built at our Norfolk factory, the summerhouse was then delivered and installed by our expert, in-house fitting team. This traditional and charming National Trust Oxburgh Shed is from our collection of hand-crafted FSC® certified timber garden sheds that are designed and made in our Norfolk factory. Inspired by the many National Trust properties of East England, Crane Garden Buildings boast a collection of sheds and summerhouses that have traditional characteristics and take their names from remarkable properties cared for by the Trust. With each product sold from this range, a contribution is made to the National Trust to aid them in their efforts to preserve special places close to our hearts. This contemporary and classic Salthouse from our range of Garden Studios was recently installed for a customer based in Salperton, Gloucestershire. The studio measures 3.0 x 3.6m and is fully insulated with an electrical pack and heater, making it fully functional all year-round. This large garage in our natural light oak preservative was recently installed for a customer based in Stroud, Gloucestershire. A large size of 5.4 x 5.4m, the interior of the garage has an external partition making it perfect for additional storage. We recently installed this 1.8 x 2.4m Superior Shed for a customer based in Chipping Campden, Gloucestershire. They opted for an apex roofplan with a slight overhang and cedar shingle tiles, which looks natural and tasteful nestled into their garden. 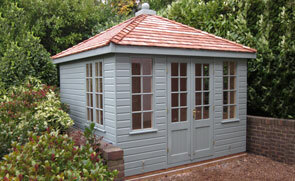 One of our latest instalments is the popular Wiveton Summerhouse in a customer’s garden in Lydney, Gloucestershire. Designed in a classic summerhouse style, the 3.6 x 3.6m octagonal building is built using only the finest, sustainable FSC® certified timber and comes with shiplap cladding as the standard exterior. This 2.4 x 3.0m Timber Greenhouse has been installed in our customer’s garden in Cirencester, Gloucestershire to enable them to start their own kitchen garden. As part of the Victoria Greenhouse range, this is a traditional and elegantly designed greenhouse, made of FSC® certified timber.